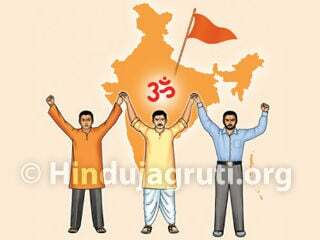 Home > Hinduism > Hindu Gods > Shri Vishnu > What does the idol of Lord Vitthal with His hands on the waist signify? * Although Hanuman is an incarnation of Lord Shiva, He being a great devotee of Lord Rama, the Vishnu principle in Him is very high. A tuft of hair on the head (shendi). A musical instrument called the vina (a stringed musical instrument) around His neck. With the pull of one string of the vina, particles of nourishment are generated. These are collected by Lord Vishnu. Vaishnavites believe that the universe was created by the sound of the vina. Shaivites believe that the same occurred by the sound generated through Shiva’s small hourglass shaped drum (damaru). Always wandering about in the three regions. 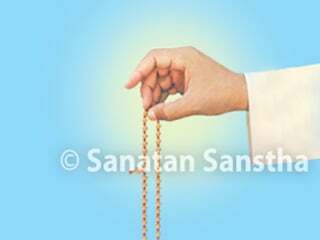 Instigates others but only to assist The Lord’s mission and to reduce defects like ego, etc. in others. 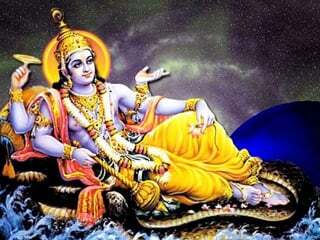 He is Lord Vishnu’s close disciple, that is one who has merged into the Omniscient Vishnu. B. He is called a devarshi (saint of a certain heavenly order). 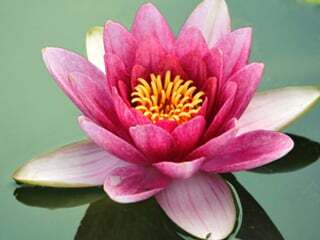 Narad is the son of Lord Brahma. He helps in the accomplishment of The Lord’s mission. Brahman means worthy of spiritual experience. Narad gets spiritual experiences and gives them to others; hence He is referred to as a great sage (mahamuni). A sage is the one who speaks only on Spirituality. D. Composition of holy texts : The Naradbhaktisutras, Narad Puran, Naradsanhita and Naradpancharatra are written by Him. He is a celestial musician (gandharva). He has the countenance of a horse. He is the master of the two Hindu lunar months, Madhu and Madhav (Chaitra and Vaishakh). In the month of Chaitra he accompanies the Sun deity (Surya) in His chariot. Player of the vina (a stringed musical instrument): The name of the vina is Kalavati. The tanpura (tambora – a stringed musical instrument) has acquired its name from him. On special occasions he also visits the earth. His wife is Rambha and his daughters Manovati and Sukesha. ‘The word Viththal has varied origins. According to late Mr. Rajvade it was derived from the word Vishthal. Vishthal is a place far-off in a forest. It thus implies that Lord Viththal is a deity who resides in the forest. Dr. R.G. Bhandarkar says that the variation of Vishnu in Kannada becomes Bitti and Viththal is derived from this variation. According to the variation in the Aryan-Prakrut language it becomes Viththu. Mr. C.V. Vaidya too gives the same opinion. Late Vishnubuva Jog narrates the origin based on Saint Tukaram’s devotional song (abhang) ‘Vicha kela thoba (वीचा केला ठोबा)’ as vi-vid (वि-विद्‌) means to know or devotional knowledge and thoba means an idol. Thus Vithoba becomes an icon of spiritual knowledge. Vithoba is also known as Pandurang. One cannot tell how this Name was derived as actually Pandurang is a Name of the fair complexioned Shiva. In Kannada this becomes Pandarange. So Dr. Bhandarkar opines that the abode of Pandurang or Pandarang is Pandharpur.’ Several people wonder how He is named Pandurang (white in colour) despite His idol being dark complexioned. Besides the point above the answer is that to a true devotee His idol appears white through the subtle visual organs. 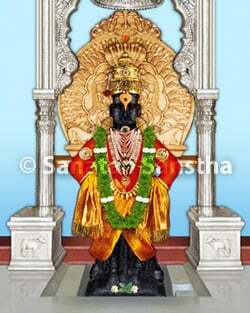 Viththal is worshipped on the first and Pandurang on the second ekadashi (eleventh day) of the two ekadashis celebrated in a Hindu lunar month. Consorts of deities are their Energies. They are of two types, saviour and destroyer. Viththal being the deity of sustenance both His Energies, that is consorts, are associated with creation and sustenance. Rai and Rukmini are Viththal’s consorts. Rai : Rai is a particle of earth. It represents the procreative potential of the earth. [Shirish is the flower borne by mustard (rai) plant.] Rai is also known as Padmavati or Padubai. Padmakosh means the uterus. Rukmini (Rakhumai) : Rukmini means the form of a snake hole or a conch. These also represent the uterus. Viththal’s idol is dark complexioned with protruding eyes and stands on a brick with hands held on the waist. When Pundalik served his parents Lord Viththal was appeased and appeared before him. At that time to avoid any lapse in service towards his parents, Pundalik threw a brick and asked The Lord to stand on it. The Lord stood watching his service with admiration. This idol is different from idols of other deities which wield either a weapon or bestow a blessing with the hand. It depicts Viththal observing everything as a spectator (sakshibhav). The sense organs lie above and the motor organs below the waist. Hands on the waist means the one with the motor organs within His control. Vyankatesh has several Names – Vyankoba, Venkatraman, Venkatadhvari, Venkatadri, Shrinivas, Balaji, etc. Another Name is Tirupati. Tiru means Shri, a title which implies opulence. 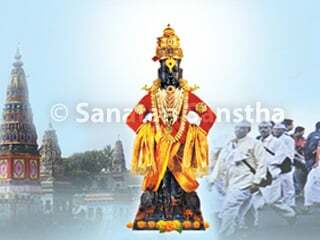 So Tirupati means Shripati Vishnu. Since the radiance of Balaji of Tirupati cannot be easily tolerated, His eyes are half closed. Lakshmi is not beside Vyankatesh. Her temple is situated below the mountain in the village Tiruchanur. Here She is called Padmavati or Almelumang (Alamelumang). The shepherds call Padmavati, Padubai. She is also described as Vishnupriya. ‘The Garud has acquired a great deal of importance in the Vaishnavite sect. It is considered a major deity from the family of Vishnu. Just as Nandi (the bull) is present in the service of Lord Shiva, so also is Garud (the eagle) in the service of Lord Vishnu. In several temples of Lord Vishnu, a special pillar is erected. This is called Garud’s pillar (Garudkhamb). 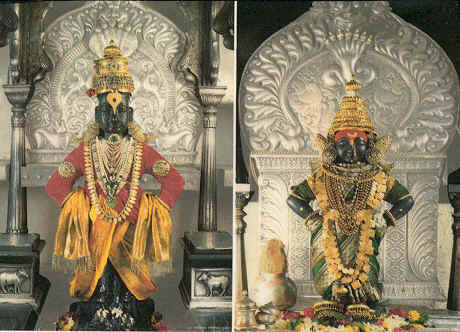 This idol of Garud in front of Lord Vishnu is usually made of black stone and is rarely of wood. The idol has a human form but a beak and wings of a bird. It stands in a posture with hands folded in obeisance (namaskar). When Garud has four arms it is called Vainateya. Another of its names is Arishtanemi. A. The Garud science (Garudvidya) : In Sanskrut literature there is a science called the science of snakes (sarpavidya). The science of poisons (vishvidya) is a synonym. 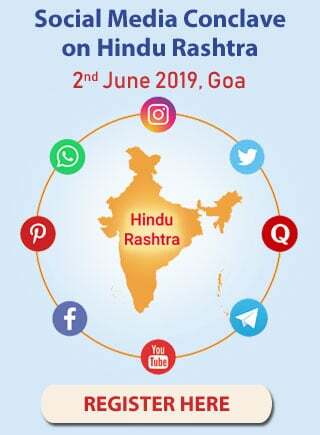 Shri Shankaracharya has named it the garudvidya. The science of snakes is used to charm snakes. Garud is the deity of this science.’ The one who knows this science is called a snake charmer (garudi). Meaning : We are quite familiar with the Absolute Being in the form of an eagle. We meditate on that golden-winged Garud. May he inspire our intellect benevolently. Once the two of them had a quarrel over sharing of the offerings (dakshina) given to them. At that time Jai cursed Vijay saying “You will become a crocodile”. Vijay retaliated and cursed that Jai would become an elephant. Thereafter both repented for what they had done and surrendered to Lord Vishnu who promised them that He would uplift them after they had undergone the curse. By the influence of the curse they came to be born on the banks of the river Gandaki, one as a crocodile and the other as an elephant. Once in the Hindu lunar month of Kartik, when the elephant entered the river for a bath the crocodile held its leg. The elephant then fervently prayed to Lord Vishnu for his deliverance. Lord Vishnu manifested there, released both of them from the bondages of the curse and took them to His divine abode (Vishnulok). Once when Sage Sanak along with other sages had gone to pay obeisance to Lord Vishnu, Jai and Vijay stopped Them. As a result, the sages cursed them as “You two will be born as demons”. When they pleaded for mitigation of the curse the sages replied, “After three births you will be liberated and will return to Vaikunth”. To undergo this curse Jai and Vijay were later born as Hiranyaksha and Hiranyakashipu, Ravan and Kumbhakarna and Shishupal and Vakradanta respectively. 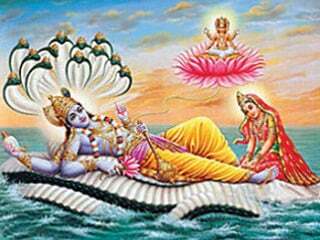 Each time they were slain by one of Vishnu’s incarnations and finally after three births they returned to Vaikunth. The colour of a Shaligram varies. Its name is derived from its colour – 1. White – Vasudev, 2. Blue – Hiranyagarbha, 3. Black – Vishnu, 4. Red – Pradyumna, 5. Dark green – Shri Narayan, 6. Dark blue – Nrusinha or Vaman and 7. A shaligram with twelve circles on it is called Anant. Information on the main Divine Energy (Shakti) of Lord Vishnu, that is Lakshmi and also others is given in ‘Science of Spirituality : Chapter 18 – Divine Energy (Shakti)’. Some of the incarnations that Lakshmi assumed when Vishnu incarnated are given in the table below. Lakshmi sits at the feet of Her master, Vishnu because He holds His devotees and not Lakshmi close to His bosom! Lakshmi looks after the spiritual and worldly needs of these devotees of Vishnu (or rather Vishnu Himself does so using Her as a medium). The 'Golden womb' poetically rendered as the source of the creation of the universe.